Potty training is a tricky business that can end up being a downright debacle without the right training pants. If the trainer is too similar to a diaper, your child is more likely to let loose and have accidents without much consequence. But if you go straight to underwear, you have to worry about cleaning up big messes in the car or out in public, while your kiddo still gets the hang of waiting to go on the potty. 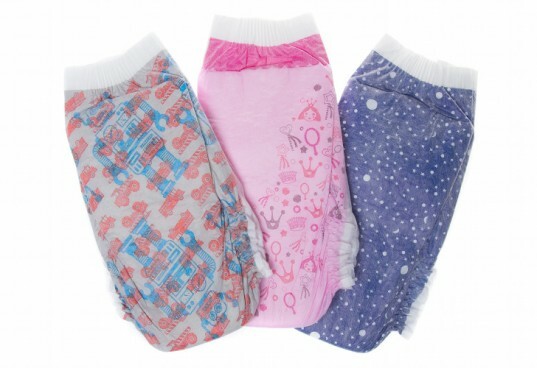 We have rounded up some great eco-friendly training pants that each have unique features that will help your child succeed in potty training, without flushing the earth down the toilet, so to speak. So put those disposable Pull-Ups back on the shelf and opt for one of these green training pants options instead. Blueberry Trainers are designed to build your child’s confidence by feeling like real underwear while still having partial waterproof qualities. The trainers are made with cotton velour and a hidden layer of microterry and PUL. The trainers can catch small accidents throughout the day. Available in 3 sizes to fit 22-42 pounds and in 12 different colors. We love the Charlie Banana 2-in-1 training pants since they double as a reusable swim diaper! The training pants outer layer is waterproof while the inside is a soft organic cotton lining. They are easy to pull on and off. The training pants are available in 4 sizes to fit children 11-55 pounds in a variety of stylish prints and colors. Target is now carrying 2 of the training pants swim diapers in exclusive prints, Cherry Blossom and Under the Sea. GroVia’s My Choice Trainer gives your child the choice to mix and match colorful panels to create their own style. The trainer is a pull up design with side flex panels that fit 1-3T. The trainer is waterproof with an ultra durable TPU outer. It has an absorbent layer made up with 55% hemp and 45% cotton and also a hidden pocket to add extra absorbency for nights. The trainer also has a GroCool inner layer to let your child know they are wet. Smart Bottoms Lil’ Trainers are made with an organic cotton inner layer, fleece outer layer, organic cotton snap in insert, and PUL in the wet zone. The Lil’ Trainers are available in small and large for 20-30 pounds. Some parents prefer the traditional pull-up design, and The Honest Company has designed a plant-based biodegradable disposable trainer. The training pants have tear off sides for easy removal. They have a soft cloth-like feel so they are more like underwear and less like a diaper. The trainers are made from chlorine-free wood pulp, BIO-core, plant-based PLA, non-toxic adhesives, polymer spandex and Polyolefin, polyurethane & non-AZO dye. You should totally mention Antsy Pants, they have a rental program that makes them super ready on the pocket book! Blueberry Trainers are designed to build your child's confidence by feeling like real underwear while still having partial waterproof qualities. The trainers are made with cotton velour and a hidden layer of microterry and PUL. The trainers can catch small accidents throughout the day. Available in 3 sizes to fit 22-42 pounds and in 12 different colors. GroVia's My Choice Trainer gives your child the choice to mix and match colorful panels to create their own style. The trainer is a pull up design with side flex panels that fit 1-3T. The trainer is waterproof with an ultra durable TPU outer. It has an absorbent layer made up with 55% hemp and 45% cotton and also a hidden pocket to add extra absorbency for nights. 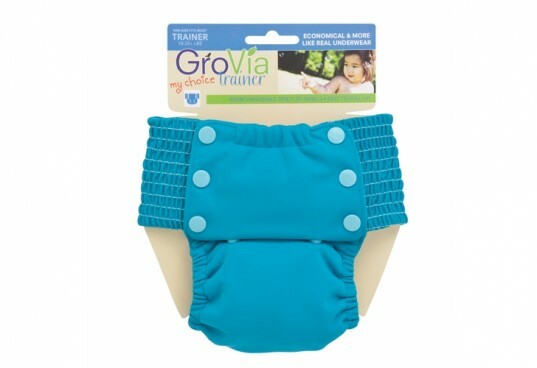 The trainer also has a GroCool inner layer to let your child know they are wet. Smart Bottoms Lil' Trainers are made with an organic cotton inner layer, fleece outer layer, organic cotton snap in insert, and PUL in the wet zone. The Lil' Trainers are available in small and large for 20-30 pounds. Some parents prefer the traditional pull-up design, and The Honest Company has designed a plant-based biodegradable disposable trainer. The training pants have tear off sides for easy removal. They have a soft cloth-like feel so they are more like underwear and less like a diaper. These trainers are made from chlorine-free wood pulp, BIO-core, plant-based PLA, non-toxic adhesives, polymer spandex and Polyolefin, polyurethane & non-AZO dye.